Suzuki has extended its support levels to Aussie farmers. The company is offering up to $1500 value added bonus\* available on all models from Suzuki's hard-working, value-packed farm ATV range. The 2011 model of Suzuki's exciting, ready-to-race four-wheeler, the QuadRacer R450 has arrived in Australia. After winning the 2008 AMA Pro ATV Championship, Suzuki's QuadRacer R450 is even better in 2009, with a number of key improvements and a bold new black livery. The all-new, 2009 Suzuki QuadSport Z400 now sports a stunning new, race-inspired red colour scheme to accompany its sensational performance. The all-new, 2009 model of Suzuki's class-leading QuadSport Z400 all-round sports ATV is now available in Australia. Suzuki’s fun-filled 2007-model QuadSport Z400 ATV is now available in Australia. Suzuki Australia is excited to unleash its all-new KingQuad 450 into Australia, following the success of the ground-breaking KingQuad 700 ATV. Suzuki’s exciting, all-new, ready-to-race four-wheeler, the QuadRacer R450 has arrived Downunder and is all set for success in Australian ATV racing. Suzuki Motorcycles has announced details of its exciting, all-new, ready-to-race four-wheeler set to storm the Australian ATV racing arena in 2006; the QuadRacer R450. Suzuki Australia has announced details of a new king for 2005 – an all-new powerhouse ATV, the KingQuad 700 (Suzuki LT-A700X). Suzuki Motorcycles has expanded its benchmark QuadSport all-terrain vehicle range with the arrival in Australia of the new QuadSport Z250. 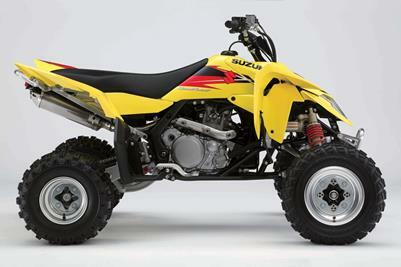 Suzuki’s first true sports ATV, the QuadSport Z400, is now available with a white or yellow colour option. The ground-breaking sporty all-terrain four-wheeler combines exciting performance, looks and ability. Suzuki Motorcycles has announced the expansion of its benchmark QuadSport all-terrain vehicle range with the introduction of the new QuadSport Z250. Suzuki has launched its first true sports ATV, the QuadSport Z400. The new sporty all-terrain four-wheeler combines exciting performance, looks and ability, with an amazing level of user-friendliness. Suzuki is making good its promise to revitalise Australia’s ATV scene with the introduction of its newest and most innovative ATV model, the LT-A500F Vinson. Suzuki’s LT-F500F all-terrain vehicle is now even more versatile, with the addition of selectable two or four-wheel drive. Suzuki’s Quad Master 50 will be available in red and yellow, from May 2001.